When mom's working at home, these summer crafts will keep kids busy. 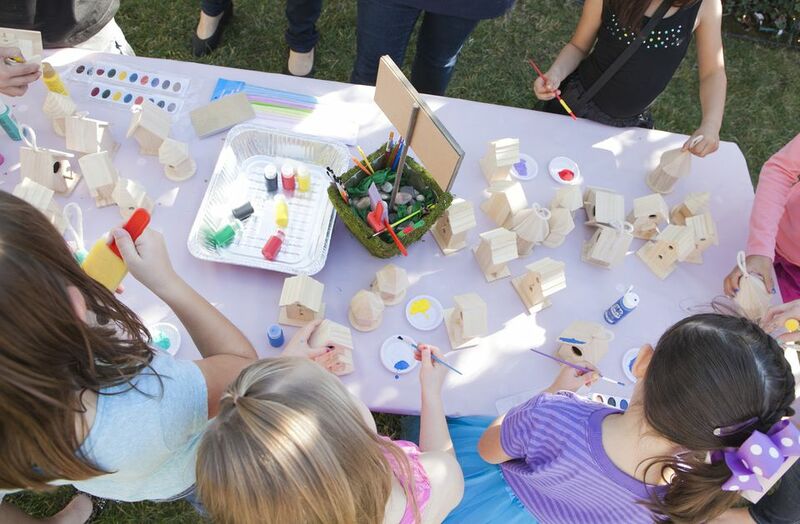 Looking for easy art projects to keep the kids busy this summer? Craft ideas like these, which all require very little adult supervision, can be a lot of fun for kids, while helping you get a little work done! Be sure to choose the right craft project for your children’s ages and interests. Or, it could turn into mom’s summer crafts project. These summer craft ideas require very little adult help but pack a lot of fun. Depending on your children’s ages and abilities, you may need to be nearby or do some prep work in advance, but you shouldn’t have to participate. If you find you are needed for constant hands-on help, then try a different activity next time. Also remember that big kids make great helpers for little kids. These summer craft ideas for young children may take some prep, work and you'll want to be in the room. But try not to jump up every time they encounter a problem. This is how they will learn to be independent. Lacing yarn around these large letters is a great way to reinforce lessons on the alphabet, while at the same time improving fine motor skills. For toddlers and preschooler, you will want to cut these shapes in advance and let them do the lacing. Because the letters are so large kindergarteners and first graders may be able to cut the letters themselves if you are nearby to supervise. Again, if your child is old enough and skilled with scissors then cutting out the foam letters could be a great activity. But if not, buy the pre-made foam letters and let them stick the magnets to the foam. The real fun begins when they start building words and letters on every metal surface they can find. String colorful loops of cereal on chenille to make lovely jewelry. This activity combines snack time and crafts. What fun! Of course, your “beads” may get eaten up before they are ever strung. If that’s a problem maybe try these noodle and rice crafts, which are a handy--but not as tasty--medium. Family Crafts has a seemingly endless supply of free, printable coloring pages, so print a new one every day for your child. Use them in your themed collages too. At this age you can try some messier projects because kids can clean up after themselves. Most will be able to use scissors fairly independently but may still need supervision. Once your child is an independent cutter, creating collages can occupy him for hours. Use magazines, copies of family photo or just about anything else that will stick to paper. But also encourage kids draw on their collages or maybe add poems or other written items. Vary this activity by adding themes, i.e. my favorite foods, best friends, etc. This is an activity that some kids will enjoy for many years. My teenager still makes collages with photos of friends, album art from favorite music and words cut from magazines. Use the templates in this project's instructions to print out each letter, and every day let your child paste on or draw items that begin with that letter. At the end of the summer your child will have an alphabet book to review. Kids at the older end of this range can make an alphabet book with younger siblings but can write as many words as they can think of around the edges. Combine birdseed and bagels and hang this craft out for the birds. This project is simple enough for very young kids (except for cutting the bagel). The question is how messy will it get. If you want to get any work done, best save this project for kids old enough to clean up after themselves. Visors are just one of dozens of foam craft pieces that can be made into instant (and wearable) art. Younger kids can simply stick other foam pieces on them or kids with good cutting skills can create animal faces to wear. Candy "growing" from cute painted pots. Kids old and young will love this one. Younger kids can decorate the pots with markers or foam pieces. Teens and tweens can paint them. Teens and tweens may enjoy some of the above summer craft ideas (like the collage or birdfeeder), if done with younger siblings or scaled more to their level and interest. But these ideas below may capture their attention even better. Like the birdfeeder, younger kids younger can most certainly make apple prints, but paint is not a practical while-you-work activity until they can work fairly neatly. If your tween has not been taught to use a knife you may want to cut it for him or her. Try other fruits or more printmaking projects. This is a very easy craft. Younger kids could certainly make these. But teens and tweens will enjoy them more. Girls can make them as gifts for friends. Bracelets and bath salts are for girls, but boys like to draw as well as girls And they may like to draw cartoons even more. So get your teen a sketchbook and let them start learning to draw this summer. The instructions on many of these projects have suggested ages, but keep in mind that these are just suggestions. If you are only supervising and not participating, you may find that the age range is too young.